Microscopic flakes of graphene add strength and durability — but also raise cost and safety concerns. Scientists have been tinkering with concrete in an effort to improve upon the world's most widely used construction material — and they’ve notched some notable successes. New forms of concrete can trap and store the greenhouse gas carbon dioxide, break down pollutants from exhaust fumes, and help protect aging infrastructure by sealing cracks as they form. 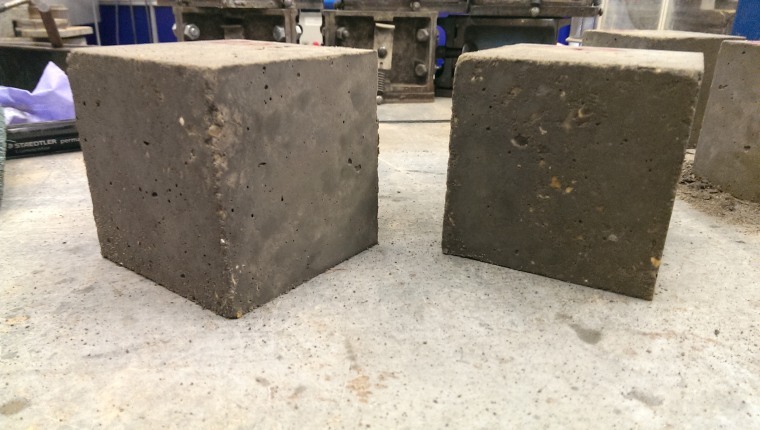 And now scientists in the U.K. have developed a “green” concrete that they say is more environmentally friendly than the ordinary stuff, as well as more durable and more than twice as strong. “We were not expecting it to be that strong,” said Prof. Monica Craciun, a professor of nanoengineering at the University of Exeter and a member of the research team responsible for the new material. She called the material an "absolute game-changer" in a written statement and said a university-affiliated startup to sell it could be launched by year-end — although other experts gave a more measured assessment of the material's immediate commercial potential. The new form of concrete looks like ordinary concrete but gets its special properties from the addition of microscopic flakes of graphene, a form of carbon that is one of the world’s strongest materials. Greater strength means less of the stuff would be needed to construct walls and other structures. That’s significant since making cement — concrete’s principal ingredient — accounts for 5 percent of global emissions of the greenhouse gas carbon dioxide. And if walls and other components of buildings can be made thinner, new design possibilities open up for architects and builders who work with concrete. Craciun said the concrete-graphene composite is four times more resistant to water infiltration than ordinary concrete — suggesting that buildings and infrastructure made of it might stand up better over time, especially in flood zones. The composite material is also more elastic than ordinary concrete, meaning it might be a better choice for construction projects in areas prone to earthquakes. And as a better conductor of electricity than its conventional counterpart, the composite material might find surprising new applications. Craciun envisions roadways whose surfaces could be electrified so they heat up to melt snow and ice. But Ulm expressed doubts about the commercial viability of the concrete-graphene composite, predicting that because of the high cost of graphene it was more of a "concept material" than one that would soon come to market. Dr. Rackel San Nicolas, a civil engineer at the University of Melbourne in Australia and an expert on advanced construction materials, echoed Ulm's assessment. "I don't believe it is something that is ready to go right now," she said of the new material in an email to NBC News MACH. Additional research is needed, she said, including studies to determine whether the tiny graphene particles would pose any health or environmental risks. A paper describing the research was published April 23 in the journal "Advanced Functional Materials."